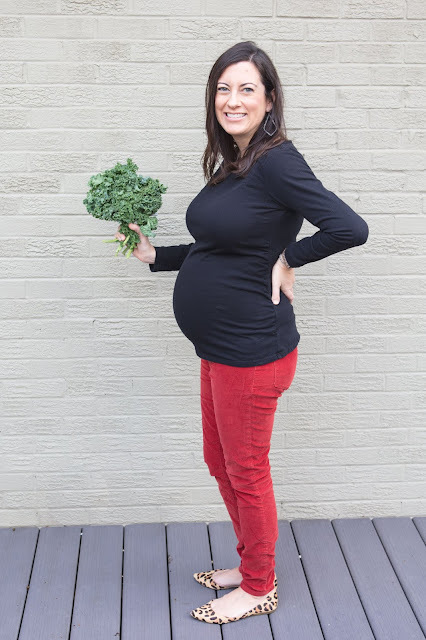 Baby is the size of: kale! Maternity Clothes: Low point - my maternity tops from my first pregnancy don't fit anymore! I'm quite a bit, um, bustier this pregnancy. More shopping it is! Cravings: French Toast with Nutella, frozen chocolate covered bananas, chocolate mousse, chocolate dipped strawberries... so much for not craving sweets! Indian cuisine is also still high on the list. Aversions: Nothing at the moment! It makes dining out super challenging because everything on the menu looks good! Symptoms: Leg cramps, acid reflux, nausea when I'm hot, hip pain... and I'm super emotional. My poor husband. What I Miss: I've reached the point where I can't reach my toes to give myself a pedicure. What I'm Looking Forward To: We ordered the furniture for baby's nursery and I cannot wait to start nesting! We're keeping it neutral with whites and creams. Boy or Girl: We go back and forth on what we think! Max is still leaning toward GIRL - he's nicknamed baby the feminine "Ippy" after syrup of Ipecac because I've been so sick this whole pregnancy. Parker still thinks BOY. Labor Signs: Just the Braxton Hicks! Best Moments: I'm finally back to Pilates and barre and it feels so good! I also used my birthday prenatal massage this month - heaven!